Please scroll down to view our products. 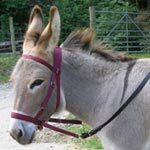 This website lists most of the products that we have designed, made and then tested on our own animals. We have designed and made many "one off" items for handling and training. If you have a requirement that isn't covered in these pages we'll be happy to discuss it with you and produce items to your measurements and/or sketches. We are also able to repair and modify rugs and all manner of webbing items. All stock sizes of headcollars will be altered to fit FOC if returned within seven days of receipt with required alterations clearly marked. Goods made to your measurements will not. When ordering made to measure goods please measure carefully. THE TACK ROOM is a cottage industry. We are open seven days a week but we have our own livestock and horses to care for so we may not be able to answer the 'phone sometimes. Please leave a message, we'll get back to you. Every product is personally hand made using materials sourced in the UK, quality fittings and soft flexible webbing. We don't have a staff of employees or an automated production line and we don't buy in ready made stock from overseas. We will always do our best to ensure that you get your order when you want it but please; remember that made to measure items are, by definition, not 'off the shelf'. In busy times, such as showing season, please get your order in early to avoid disappointment. Please telephone 01547 550641 between 9.00 am and 12 noon for details or to make a payment. Orders will be sent by Royal Mail, first class, where bulk permits. During busy postal periods orders with a value of £10 or above will generally be sent 'signed for.' Posting days are Tuesday and Friday. We'll try to keep delivery charges as low as possible, usually at cost. Personal callers are welcome by appointment. Click on an image below for more info.